Keep? Buy? Share? 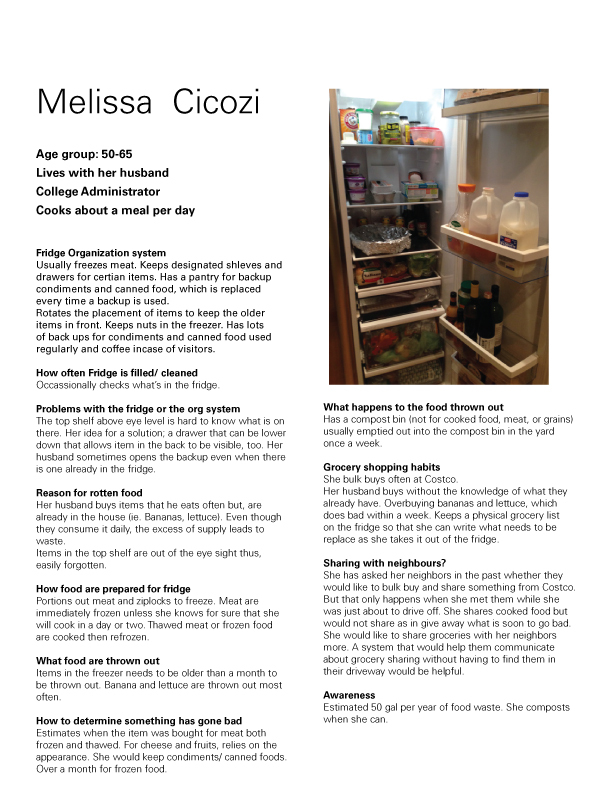 Foodr aims to reduce the problems that comes with having a communal fridge. Foodr is a mobile app for communicating about grocery purchase, disposal of items in the fridge, and sharing extra food. The app allows you to snap a picture of the food item and instantly send it to either people in your contact list or people in your radius to perform any of three different activities: Keep? Buy? Share? foodr is a mobile app that aims to help people in communal living spaces save up on money, prevent food from rotting inside fridges and reduce the food waste they produce. This project was focused mostly on conducting quantitative and qualitative user research by using surveys and interactive design probes during interviews. Our group focused on creating a mobile application that aims to increase communication between people who live in communal spaces. My role in this project was conducting 1 on 1 interviews and creating the wireframes for our mobile application prototype. I led discussions and mapping sessions for analyzing data we collected. Together as a group we collaborated to come up with the system behind how the application works. Every year in the United States, 133 billion pounds of food is wasted. That's 31% of the overall food supply. And that all gets trucked to landfills, because of us. Most people in America are not conscious about the food waste issue, therefore their day-to-day decisions are not well thought through. 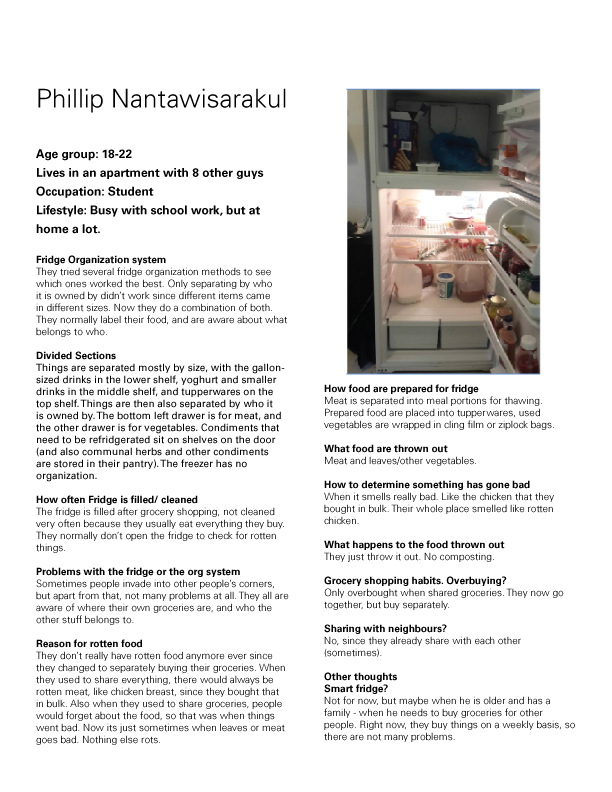 "Tossing food that spoiled in the refrigerator has become habitual behavior so that people don't necessarily see that as waste, because once something has spoiled it's not seen as food anymore,"
We started off by researching online to understand the weight of the problem better, and also on things that people have been trying to do to counter this problem. We then went into creating a stakeholder and journey map to get a better scope of the user group that we are focusing on. We then sent out a survey to the students of Carnegie Mellon University, to understand the way they deal with storage of food and food waste. We also decided to scale our problem space down to the issue of food waste being created by busy schedules and communal fridges. 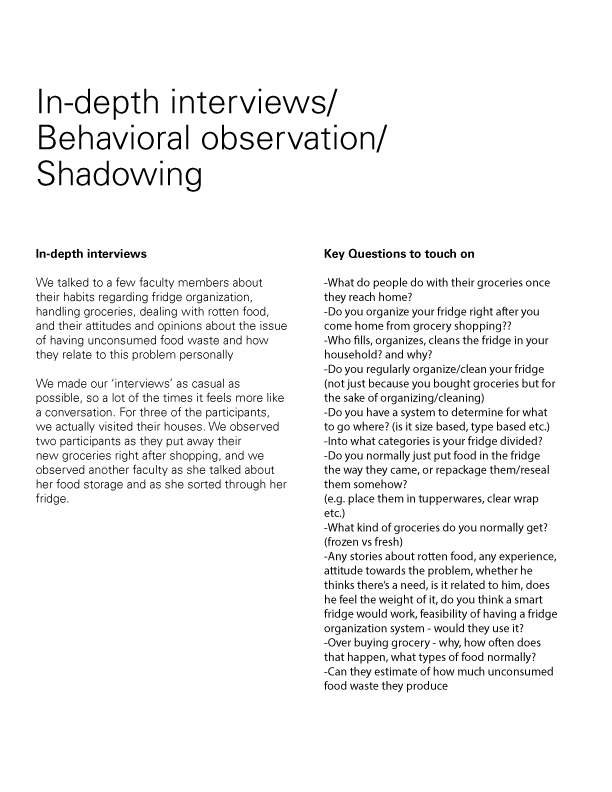 For the observations, we asked some of our interviewees to walk us through the process of them putting groceries away in the fridge, to try to get the most accurate view of what they usually do on a weekly basis. 1. Many people decide to buy their food in bulk, since it seems cheaper in the long run. However most of this food ends up going to waste, since fresh food does not last long. We want people within stores like Costco, or within communal living households to be able to communicate and share their bulk goods. 2. 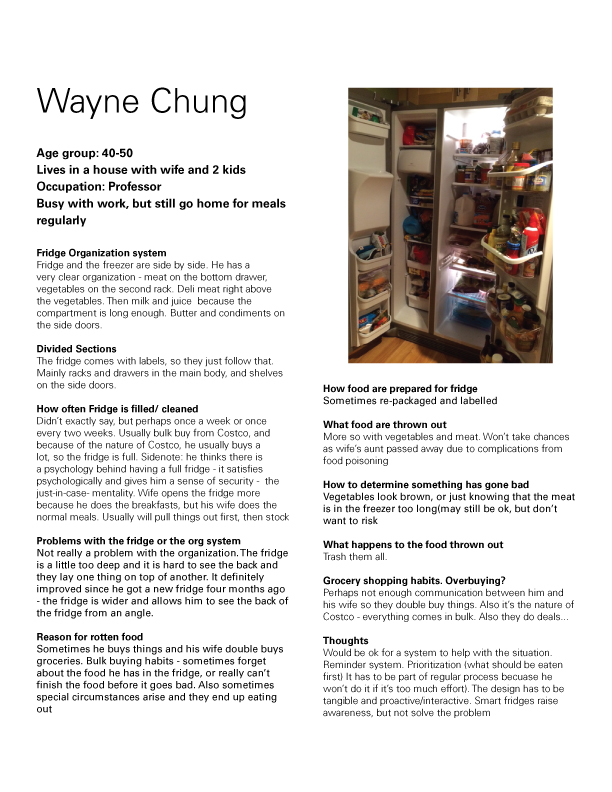 The lack of organization and the neglecting of contents within a communal fridge also creates unconsumed food waste within households and communal living spaces. We want to create a system that makes it easier for users to help remind each other that a food item has been in the fridge for a long time and should be eaten. We created a mobile application that increases communication between people who live in communal spaces. Foodr allows users to pick between the options of “Keep?”, “Buy?” or “Share?”. “Keep?” allows you to contact family members/housemates about items before throwing them out - this prevents unnecessary waste and serves as a reminder for both parties. “Buy?” allows you to share a shopping list with the people you live with. This avoids double purchasing an item, thus reducing the chances of your household overbuying similar food items. “Share?” allows you to contact one of your contacts or see who is within your radius at a store like Costco to see if they want to buy a bulk item together. For all three options, users will be able to take a photo and send it to their person of choice. The receiving end will be able to swipe left for no and right for yes.